Can "Facial Coding" Really Predict A Pro Athlete's Performance? The new owners of the Milwaukee Bucks have deep pockets and big ambitions — a combination that's led them to one-up the Moneyball teambuilding strategy and hire "a facial coding expert who reads the faces of college prospects and NBA players to determine if they have the right emotional attributes to help the Bucks." "We spend quite a bit of time evaluating the players as basketball players and analytically," said David Morway, Milwaukee's assistant general manager, who works for the owners Wesley Edens and Marc Lasry. "But the difficult piece of the puzzle is the psychological side of it, and not only psychological, character and personality issues, but also team chemistry issues." [Facial coding expert] Dan Hill contends that faces betray our true emotions and can predict intentions, decisions and actions. He employs the psychologist Paul Ekman's widely accepted FACS, or Facial Action Coding System, to decipher which of the 43 muscles in the face are working at any moment. Seven core emotions are identified: happiness, surprise, contempt, disgust, sadness, anger and fear. 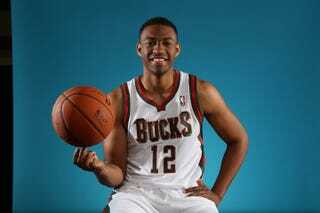 Hill's unconventional methods helped the Bucks select Jabari Parker as the team's top pick in the NBA draft; prior to tearing his ACL earlier in December, "Parker was among the leading candidates for Rookie of the Year honors." But not everyone is convinced; the Times story cites a skeptical neuroscientist who isn't certain facial analysis will be, ahem, a game-changer in the sports world. "It's not easy to get good evidence, because a player's performance and teamwork are complex outcomes, and the teams are not run like clinical trials, with coaches and managers blind to the facial coding findings and so forth. So it's hard to know whether this system works well, gives some marginal benefit or does nothing at all."